For my last gift guide, I wanted to share with y’all some of my favorite things that I’m buying for my favorite people. Whether you bestie is your mom, sister, or lifelong friend, these gifts are seriously so fun! I am obsessed with this scarf!! It is definitely on my Christmas list this year. I love the extra length and the fabric is so soft! Bauble bar earrings are so stinking cute and their gift sets give you two pairs for a discounted price! I love the colors in this set, but there are others to choose from if this isn’t your cup of tea. How pretty is this to-go coffee cup?? I love gifts like this because they are actually useful! I can’t tell you how many times I’ve been rushing out the door and I can’t find a mug and matching lid for my coffee. Such a sweet gift, especially if you put something else inside like candy or a gift card to a great coffee shop. Draper James has the cutest designs! This makeup bag comes at a great price and would be great to help organize your purse or keep things in at work! To me, stationary is a very thoughtful gift. This would be great for a friend who may be getting married! It is personal with a monogram, but it is certainly something that will get used. We all have thank you notes to write after the Holidays! I die over these monogram cups! Emily McCarthy Shoppe has the cutest personalized gifts around. These cups are so perfect as a hostess gift or for someone who loves entertaining. There are so many patterns, monograms, and colors to pick from it will be hard to choose your favorite! J Crew Factory has the cutest accessories for cold weather! I love the pom detail on this hat and it is super warm! For under $20, you can make someone very happy! I linked a similar pair of slippers in my gift guide for boys and I thought these were too cute to not put in here. I love the plaid for Christmas and the fur will certainly keep you warm! 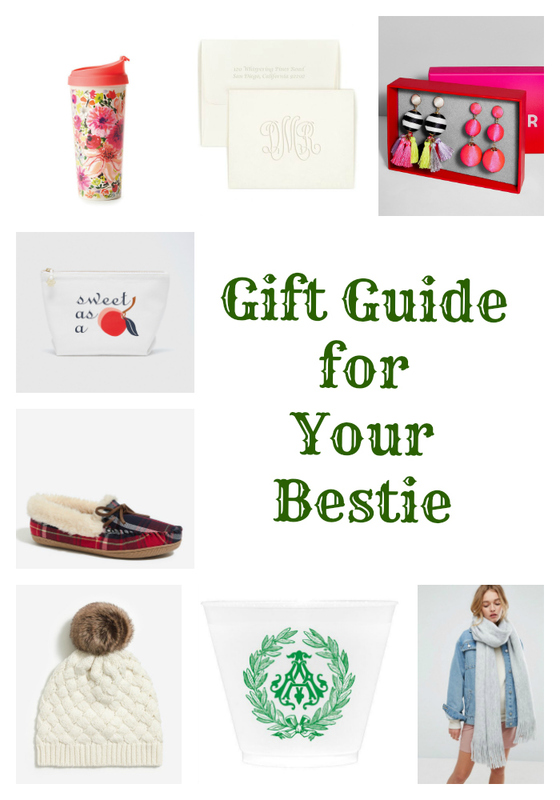 I hope y’all have enjoyed these gift guides and found them helpful! Until next year, happy shopping!